I worked at the TARC (Tax Administration Research Centre) of the University of Exeter, at the ICES (Institutional Change, Economics, Society) research unit during my PhD at IMT, Lucca, and at Brunel University, London, as a Visiting Researcher. My research is focused on Public Economics and entails topics in Taxation, Tax Compliance and Local Government Efficiency. In recent research projects (joint with Matthew D. Rablen) I have analyzed how tax avoidance and evasion impact the self-declaration of liabilities made by taxpayers and on optimal enforcement of tax laws made by tax agencies. To provide a realistic representation of the choice of economic agents, the models developed build on insights from psychology and behavioral economics. In a current research project (joint with Matthew D. Rablen) I am studying the compliance decision when taxpayers compare their consumption with others in their social network, and also to their own consumption in the recent past. In this setting, engaging in tax evasion is a tool by which taxpayers can improve their relative standing. In this exercise, formal comparative statics for optimal evasion/avoidance is derived and a role for self comparison in explaining persistent post-audit behavioural effects is uncovered. From the policy perspective, results show that there are pronounced revenue returns to the initial acquisition of network information, albeit targeting audits with highly incomplete knowledge of social networks may be counterproductive. On another strand of research (joint with Christos Kotsogiannis and Konstantinos Serfes), I am studying the optimal registration threshold for value-added tax (VAT). A common feature of VAT systems is to require firms to register above a threshold of activity. However, the discontinuity in tax liabilities generated by the threshold leads to bunching and distorts economic decisions relative to both input bought and output sold. Our research contributes to the current literature by considering an extended-form production chain (B2B2C) that allows to investigate the interaction in registration decision occurring in the business markets as well as to derive theoretical implications on how the optimal threshold might be affected by market structure and policy variables. My current empirical research (joint with Andrea Flori) is mainly dealing with the estimation of the performance of local government. Local governments provide for a sizeable part of the public goods and services supply. The considerable amount of public spending and decision making attributed to local governments calls for an evaluation of their performances. Indeed, efficiency assessment of local governments may provide meaningful information to numerous agents (e.g. the central government, local politicians, voters and firms). My research uses non-parametric frontier models to estimate managerial efficiency, to analyse the role played by exeternal variables and to investigate the characteristics of production activity. In this contribution it is investigated the impact of social interaction on optimal evasion and assessed the audit revenue gains that may be obtained by targeting audit using social network information. An analysis of optimal tax enforcement policy when taxpayer may engage in both avoidance and evasion. In this contribution it is studied the optimal avoidance decision when taxpayers evaluate their utility relative to a benchmark or “reference” level of income. 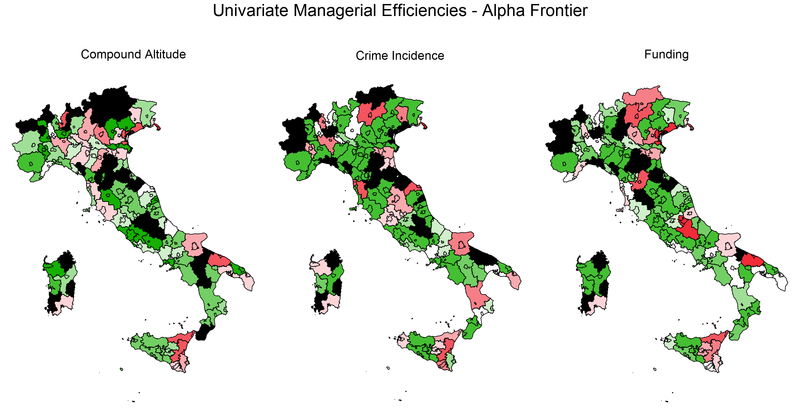 The article provides an assessment of the performances of Italian local government using conditional frontier models. © 2018 Duccio Gamannossi degl’Innocenti · Powered by the Academic theme for Hugo.